« Librarians and Wikipedia: an Ideal Match? We are apparently seeing a backlash against use of Facebook. Over the weekend a post on Facebook’s struggle to keep teens described how, although in September 2014 had 864 million daily active users, 703 million mobile daily active users and 1.35 billion monthly active users, “the company faces a significant challenge keeping the service relevant to younger users“. Earlier this week Niall Sclater provided a personal anecdote in a post on How a fifteen year-old Scottish girl uses social media which suggested “Facebook is mainly for older people who want to share baby photos“. Also over the weekend the Observer included an article by Ben Goldacre entitled When data gets creepy: the secrets we don’t realise we’re giving away. The popularity of this article can be gauged by the 323 comments made on the article to date as well as, ironically, the 7,390 shares made on social media. But Continued Use By Professionals in Higher Education? The article on Facebook’s struggle to keep teens suggests that teenagers may be moving towards use of messaging applications although a post published by Piper Jaffray earlier this year described how a Survey finds teens still tiring of Facebook, prefer Instagram. However moves towards use of messaging applications do not seem to be reflected in my professional uses of social media services. Twitter continues to be a valuable tool but I also seem to be making greater use of Facebook for professional purposes, in part helped by the release earlier this year of a bookmarking facility for Facebook posts. I also find that there are various Facebook groups for professional purposes which have been subscribed by my professional contacts who also make use of Twitter. 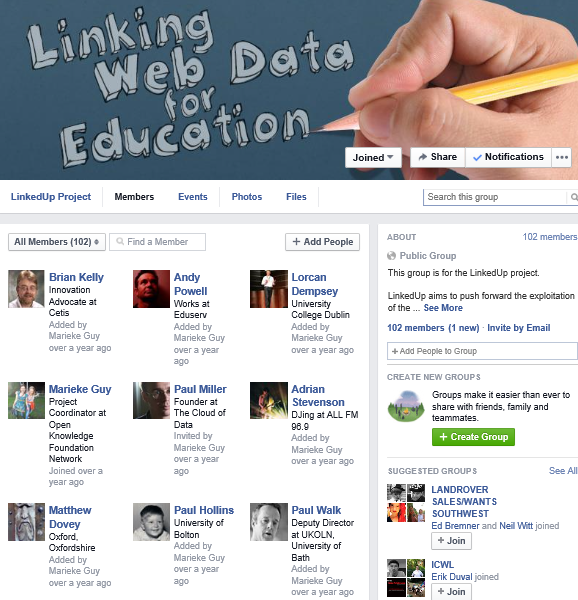 A good example of this is the Linked Web Data for Education Facebook group which has 102 members, including 35 I am connected with on various social networks. In additional to use of Facebook by professionals to support their work in additional to social interests we also see continued use of Facebook by institutions. Back in July 2014 a post on Facebook Usage for Russell Group Universities, July 2014 provided figures related to Facebook usage by the 24 Russell group universities and summarised growth since similar surveys were published in 2011 and 2012. An updated survey was carried out on 8 December 2014 which includes metrics which weren’t collected fin previous surveys, including the numbers of Facebook users ‘talking’ about the institutional Facebook page and the numbers of new ‘likes’ for the page. I hope that this data will provide a benchmark which could help to indicate a decline in interest in Facebook use: we might expect Facebook ‘likes’ to continue to grow users probably don’t ‘unlike’ pages, but the number of new pages ‘likes’ should provide a better indication of current levels of interest. Clearly Facebook page administrators will be able to view the metrics for their institutional Facebook page but will not be able to detect trends unless such data is shared. It should also be noted that, as described in a Facebook support page, an apparent decline in the numbers of ‘likes’ may be due to Facebook users managing their privacy settings: Earlier this year Facebook announced new privacy controls for Making It Easier to Share With Who You Want and we are now seeing a range of resources, such as this poster on “How to Stay Safe on Facebook” which can help to educate users on how to manage Facebook more effectively. Should Institutions and Experienced Professionals Cease Using Facebook? However rather that making decisions on professional use of social media services such as Facebook on business criteria such as the level of use, the audience profiles, the costs of providing the services and the estimated benefits, might there be an argument that organisations and individuals who place a high value on ethical business practices should cease making use of services which infringe users’ privacy and exploit their intellectual property from unfairly using their dominant position in the market place. We have been here before – back in 2004, the EU ordered Microsoft to pay a fine of over £380 million for abuse of its dominant position in the market. But beyond such infringement of monopoly legislation which are decided by a court case, might the business decisions being taken by social media companies such as Facebook be regarded as a social injustice which individuals and organisations should face up to, just as many did by disinvesting in South Africa during the apartheid era? Targetting, profiling and “personalisation” are central, and vast resources are ploughed into trying to gather or infer information about individuals’ activities and preferences based on our behaviour on the Web. Sometimes that data collection is overt and explicit: we are invited to volunteer personal data to a social media service in exchange for access to communication channels and the creation of an online profile without which we are told we are a second-class citizen. Sometimes it is rather more covert, as in the surreptitious tracking of our behaviour across Web sites through ever more complex digital sleight of hand tricks. And that tracking increasingly extends into our physical world behaviour (tracking mobile wireless signals in shopping malls, linking email addresses to “loyalty” cards and so on). Facebook currently has 864 million daily active users and 703 million mobile daily active users. The data provided in Appendix 1 gives some figures for Facebook’s use across official pages for the 24 Russell Group universities. But is such data irrelevant? I’d welcome your thoughts. This entry was posted on 10 Dec 2014 at 5:49 pm	and is filed under Evidence, Facebook. You can follow any responses to this entry through the RSS 2.0 feed. You can leave a response, or trackback from your own site. Also, Facebook is a walled garden — in order to see content you must sign up for the service and give them your data. Education institutions and professionals should keep info exchange as open as possible. Thanks for the comment. The “Facebook is a walled garden” meme was popular a few years ago but I think we need to consider what a walled garden is, whether Facebook is still a walled garden and the extend to which walled gardens are undesirable. As described in a post on Downloading Your Info it is also now possible to download one’s content. So rather than Facebook being a walled garden I think the main concerns these days relate to privacy and the commercial exploitation of content.